ARLINGTON, Va. – The Washington Capitals and Monumental Sports & Entertainment Foundation Raised $131,003 for four cancer-related charities through their Hockey Fights Cancer campaign in November. The funds will be split between Flashes of Hope, the Leukemia & Lymphoma Society, Make-A-Wish Mid-Atlantic and Pancreatic Cancer Action Network. The Washington Capitals teamed up with the National Hockey League and FORTUNE 500® science and technology company Leidos in November to educate the hockey community about cancer through Hockey Fights Cancer Awareness Month. Hockey Fights Cancer is a league-wide initiative founded by the NHL and NHL Players’ Association and is dedicated to raising awareness for national and local organizations involved in cancer care and research. The Capitals hosted Hockey Fights Cancer Night on Nov. 9, featuring a ceremonial puck drop, video tributes and other Hockey Fights Cancer related themes throughout the evening. Proceeds from MSE Foundation’s 50/50 raffle were also donated to the Hockey Fights Cancer beneficiaries. Linda Laughlin, wife of NBC Sports Washington analyst and Capitals alumnus Craig Laughlin, participated in a ceremonial puck drop, escorted to the ice by Craig. Linda is currently undergoing treatment for uterine serous carcinoma, a form of endometrial cancer. 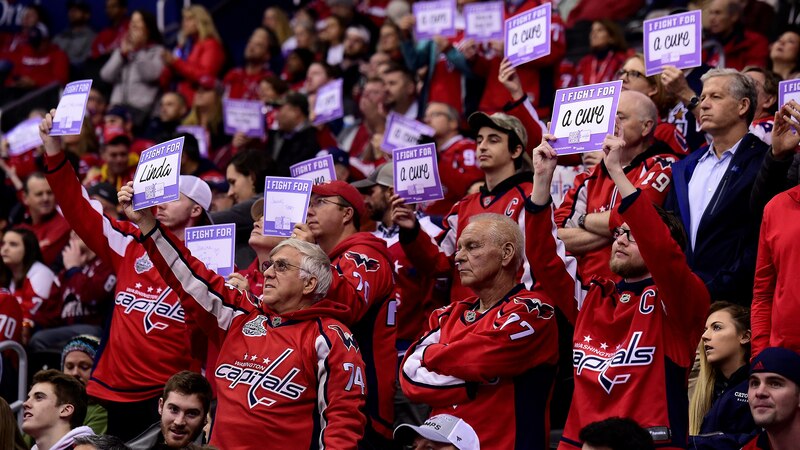 Fans were asked to show their support for those fighting cancer by holding up “I Fight For” signs during a designated timeout, as well as by sharing their stories on social media platforms by using the #CapsFightCancer hashtag. Players wore lavender warmup jerseys and helmets adorned with a Hockey Fights Cancer decal, while coaches and broadcast personalities wore Hockey Fights Cancer ties and pins. Select players used sticks wrapped in lavender tape during warmups. 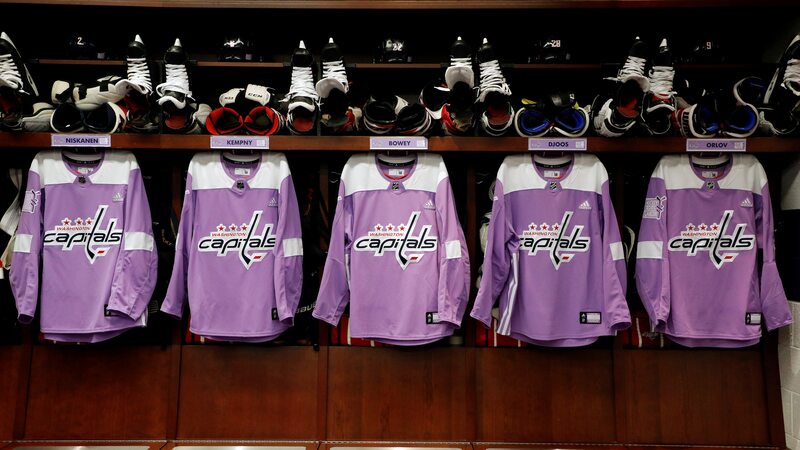 Lavender is the official color of the Hockey Fights Cancer campaign, as it represents all forms of cancer. In addition, the pregame on-ice projection featured lavender in honor of Hockey Fights Cancer. Leidos also donated two suites to Make-A-Wish Mid-Atlantic families at the game. Prior to the puck drop on Nov. 23, the Capitals and the Red Wings participated in a league-wide hockey Fights Cancer moment with their sticks wrapped in lavender tape. 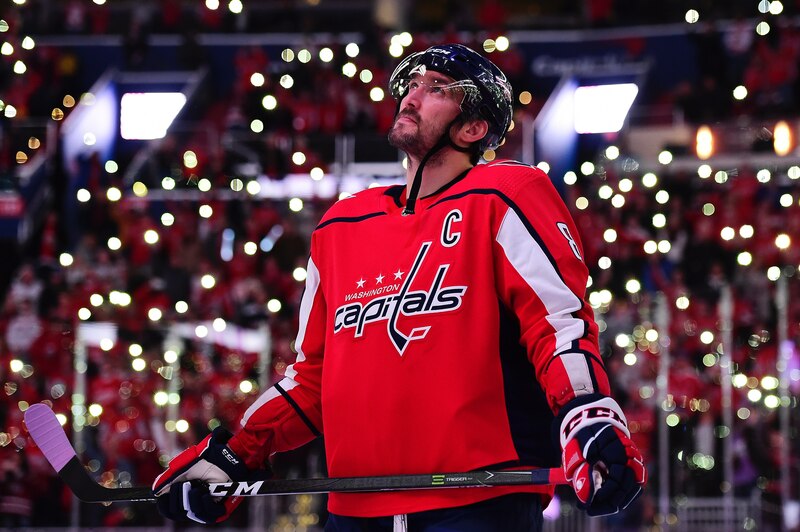 Players from each team performed a Stick Tap Salute to honor the patients and families of those battling or moving past cancer, with fans invited to turn on the flashlights on their cell phones to join the salute. 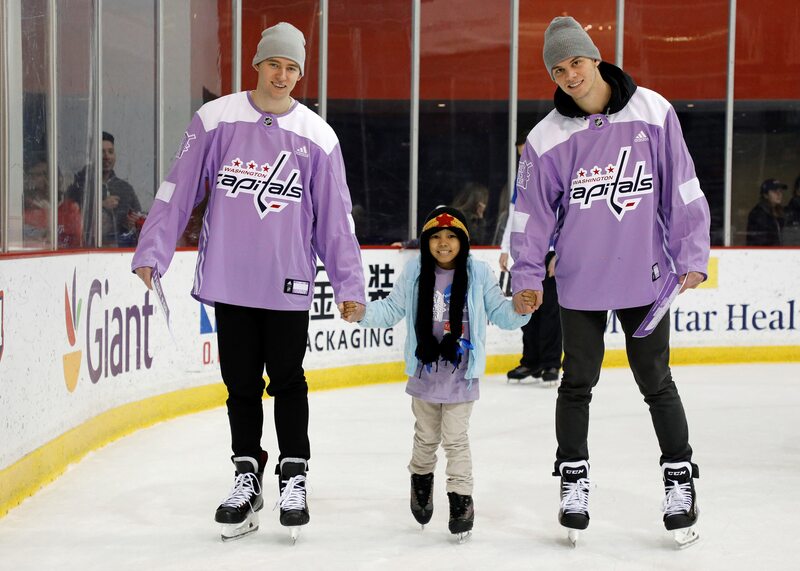 The Capitals hosted a Hockey Fights Cancer skate with Casey Cares, Flashes of Hope, the Leukemia & Lymphoma Society, Make-A-Wish Mid-Atlantic and Pancreatic Cancer Action Network at MedStar Capitals Iceplex on Nov. 10. 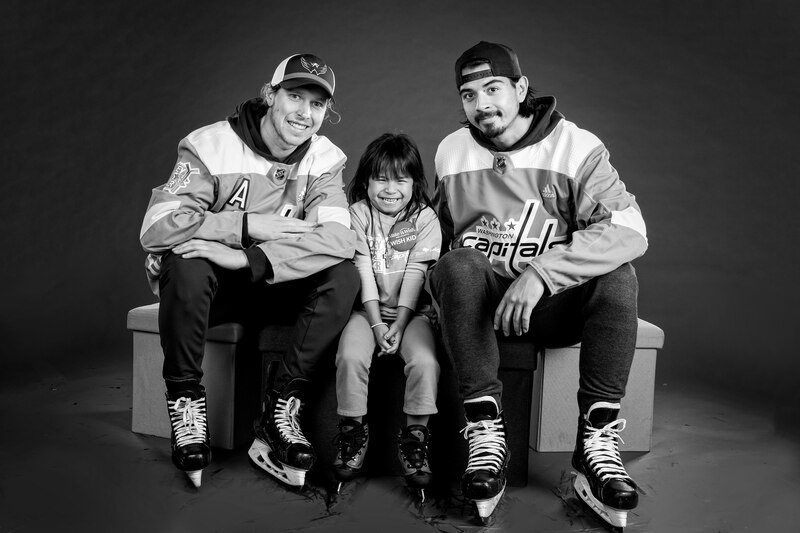 As part of the team's Hockey Fights Cancer campaign, each Capitals player was paired with a Make-A-Wish® Mid-Atlantic participant who is currently battling cancer or is in remission. During the skate, they met with their partner on the ice prior to the event beginning. In addition, several players participated in a Flashes of Hope photo shoot. Flashes of Hope is a nonprofit organization that changes the way children with cancer and other life-threatening illnesses see themselves through the gift of photography and raises money for pediatric cancer research. Monumental Sports & Entertainment Foundation currently helps fund the Flashes of Hope chapters in Washington, D.C., and Northern Virginia. Capitals players Nicklas Backstrom, Lars Eller, Brooks Orpik and T.J. Oshie along with mascot Slapshot visited with children undergoing treatment at Pediatric Specialist of Virginia on Nov. 29. They spent time with the patients and passed out hats through Ellie’s Hats. Ellie's Hats is a program that offers children with cancer and their families care and support beginning with a delivery of hats to the child fighting cancer. Monumental Sports & Entertainment (MSE) Foundation hosted two auctions in honor of Hockey Fights Cancer. The first auction featured signed lavender jerseys worn during warmups on Nov. 9; autographed, used hockey sticks with lavender tape; and signed, limited-edition Hockey Fights Cancer pucks. The auction raised $67,395. Leidos donated an additional $40,000. The second auction featured signed hockey sticks with lavender tape used during the stick salute at the Capitals Nov. 23 game vs. the Detroit Red Wings, autographed lavender player name plates, a team signed Hockey Fights Cancer jersey, and additional items. It raised $12,315. A $10 donation per ticket purchased for the Nov. 5 and Nov. 9 Capitals games using the promo code HFC was made to the Capitals’ Hockey Fights Cancer beneficiaries. For more information on Hockey Fights Cancer, visit WashingtonCaps.com/CapsFightCancer. Hockey Fights Cancer is an initiative founded in December 1998 by the National Hockey League and the National Hockey League Players’ Association to raise money and awareness for hockey’s most important fight. To date, through the NHL’s U.S. and Canadian charitable foundations, more than $16 million has been raised under the Hockey Fights Cancer initiative to support national and local cancer research institutions, children’s hospitals, player charities and local cancer organizations. The Hockey Fights Cancer program is also a component of the NHL’s “Biggest Assist Happens Off the Ice” campaign - the League’s long-standing tradition of addressing important social issues in North America and around the world. The Hockey Fights Cancer program is supported by NHL Member Clubs, NHL Alumni, the NHL Officials’ Association, Professional Hockey Trainers and Equipment Managers, corporate marketing partners, broadcast partners and fans throughout North America. Leidos is a Fortune 500® science and technology solutions and services leader working to solve the world’s toughest challenges in the defense, intelligence, homeland security, civil, and health markets. The company’s employees support vital missions for government and commercial customers. For more information, visit www.Leidos.com. Flashes of Hope is a nonprofit organization that raises money for pediatric cancer research and changes the way children with cancer and other life-threatening illnesses see themselves through the gift of photography. The goal of Flashes of Hope is to photograph every child until every child is cured. MSE Foundation and the Capitals established the D.C. chapter of Flashes of Hope and also support the Northern Virginia chapter. The mission of The Leukemia & Lymphoma Society (LLS) is: Cure leukemia, lymphoma, Hodgkin's disease and myeloma, and improve the quality of life of patients and their families. LLS exists to find cures and ensure access to treatments for blood cancer patients. We are the voice for all blood cancer patients and we work to ensure access to treatments for all blood cancer patients. For more information visit http://www.lls.org/. Make-A-Wish creates life-changing wishes for children with critical illnesses. Make-A-Wish Mid-Atlantic serves children who reside in the District of Columbia, Maryland and Northern Virginia. Founded in 1983, the organization has granted more than 9,700 wishes in the Mid-Atlantic region since its inception. When a wish is granted, a child replaces fear with confidence, sadness with joy and anxiety with hope. This year alone, 840 local children are expected to be diagnosed with a life-threatening medical condition. However, for every wish granted, at least one more local child is waiting. The community has the opportunity to make an impact today by helping Make-A-Wish to reach hundreds of kids whose wishes would go otherwise go unanswered this year. For more information, please visit: www.midatlantic.wish.org. The Pancreatic Cancer Action Network is the national organization creating hope in a comprehensive way through research, patient support, community outreach and advocacy for a cure. The organization is leading the way to increase survival for people diagnosed with this devastating disease through a bold initiative — The Vision of Progress: Double Pancreatic Cancer Survival by 2020. To continue to accelerate progress, a goal to raise $200 million by 2020 is also in place. For more information visit https://www.pancan.org/.